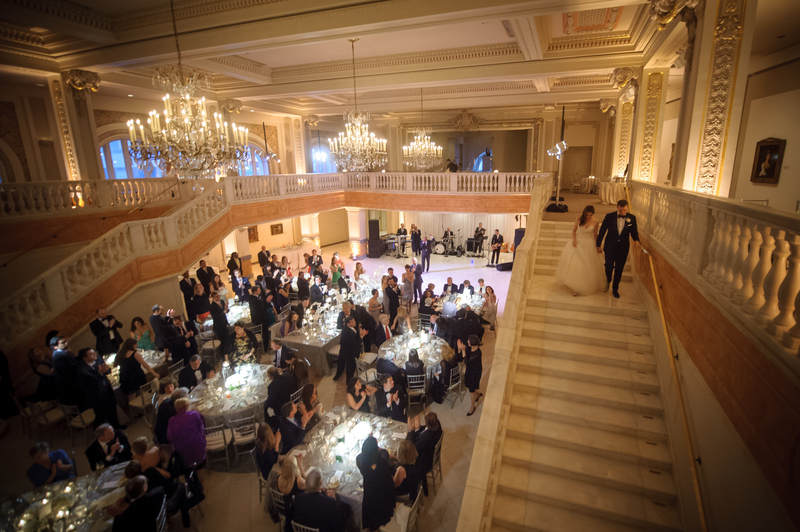 Last year I had the pleasure to work with Jordan and Justin for their stunning wedding at the National Museum of Women in the Arts in Washington, DC. 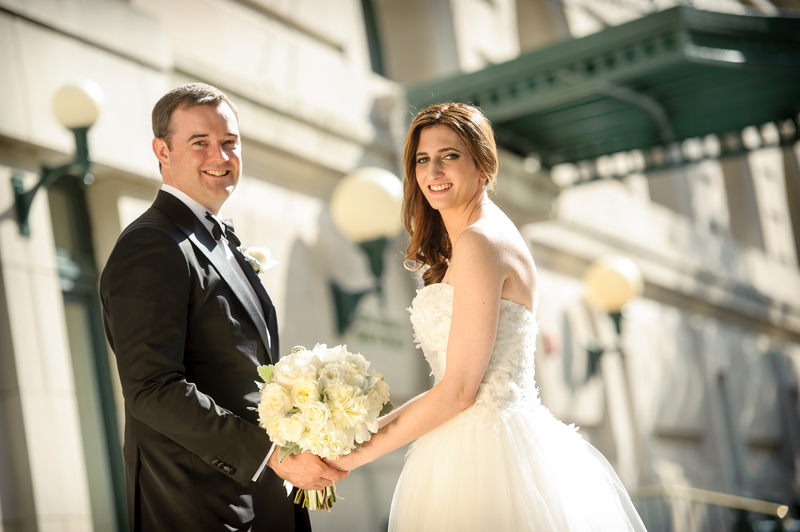 Jordan and Justin met in NYC and live in Chicago, so they planned their wedding with the help of Jordan’s parents who live in the district. 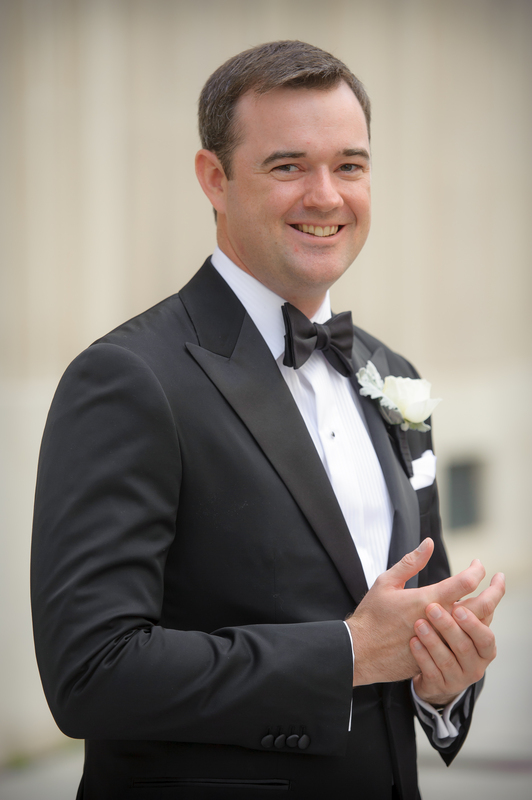 It was wonderful to work with Jordan and Justin (and parents) as their wedding planner. 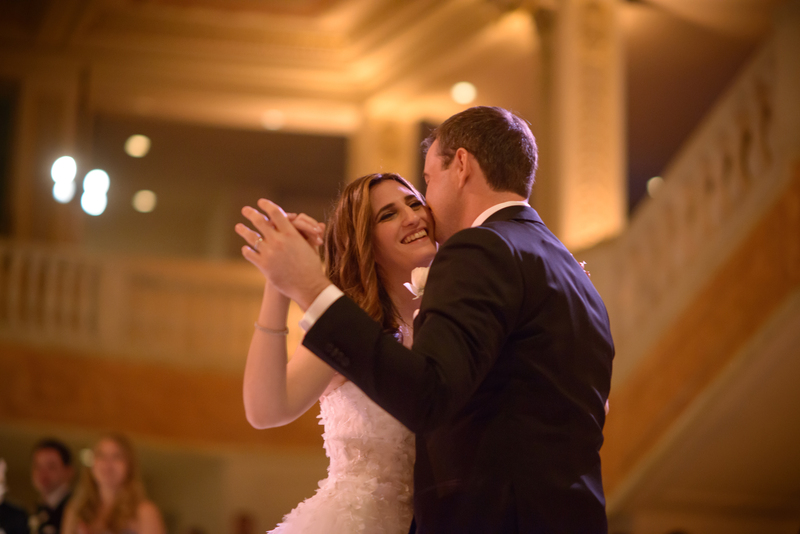 They have a great style and their vision for the wedding was something that was elegant, but not stuffy, with an emphasis on great food and music and a beautiful atmosphere. 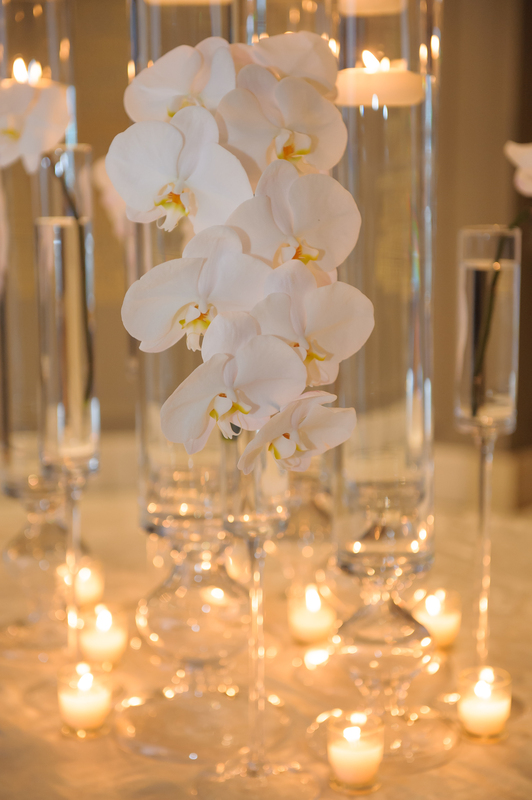 Their wedding included a gorgeous chuppah with suspended orchids by Edge Floral Event Designers. 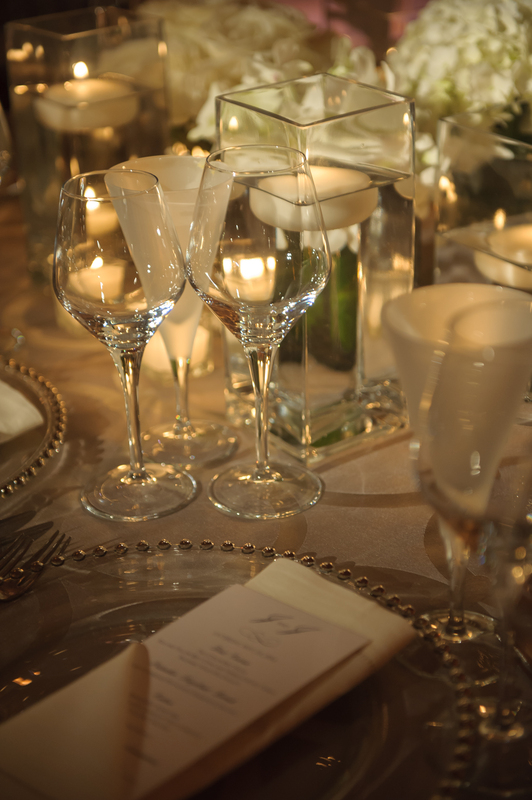 I loved the romantic yet modern, white and gray details we incorporated for Jordan and Justin’s wedding. 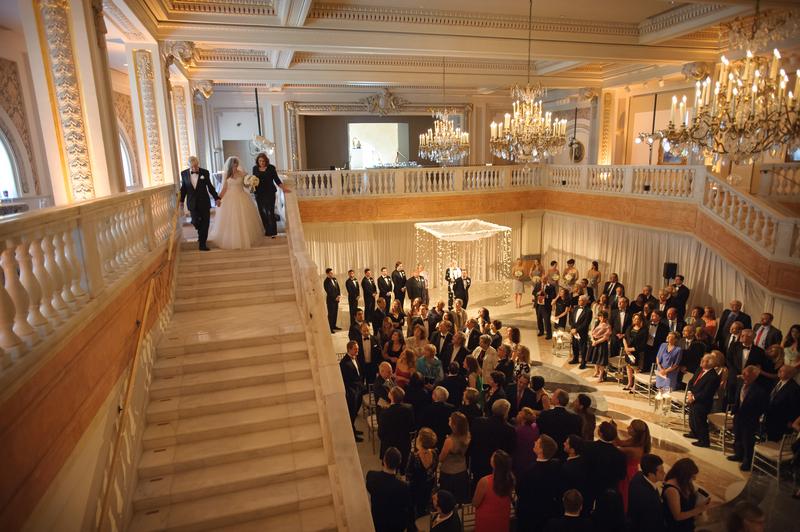 Photographer Matt Mendelsohn did a great job capturing the love and events as the day unfolded. 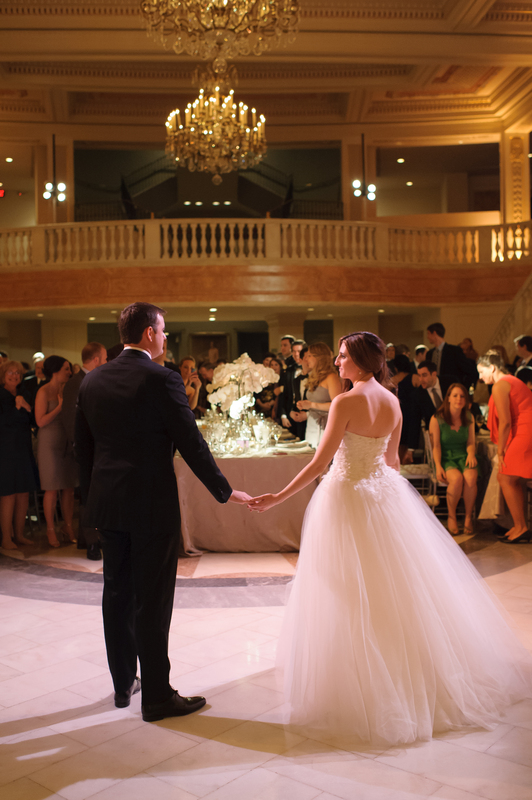 This wedding was also featured on United With Love, see part 1 and part 2. 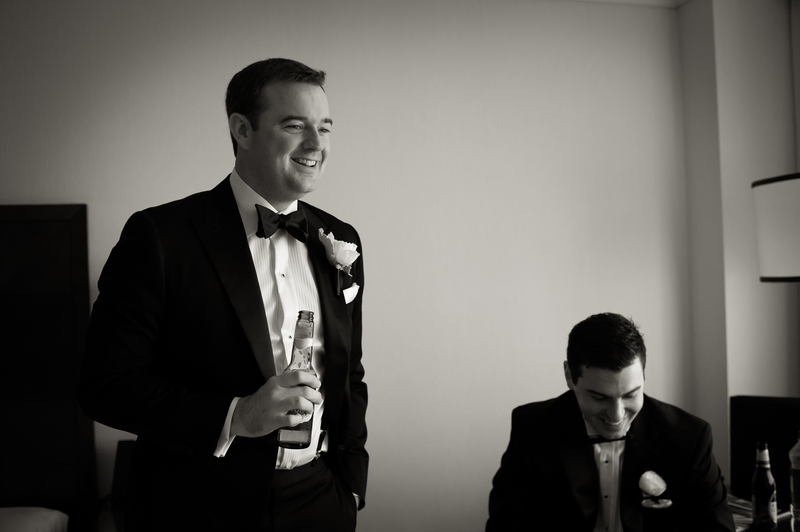 Jordan and Justin started the day getting ready at a hotel nearby with their wedding party. 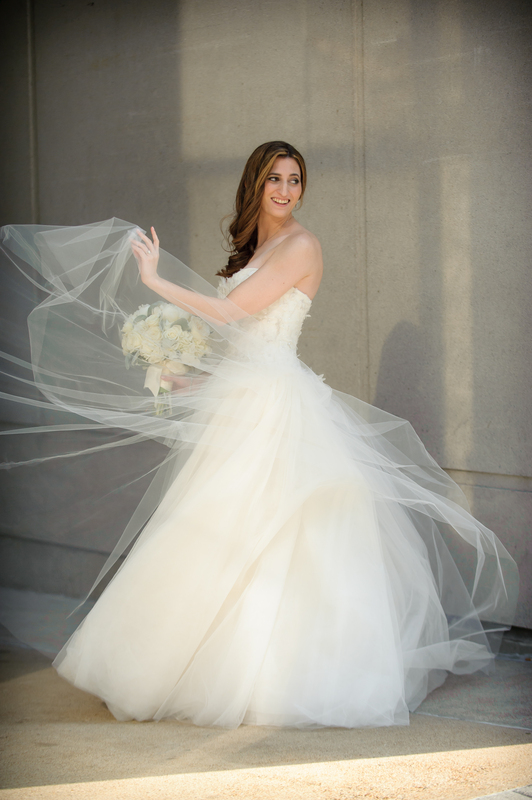 Jordan’s wedding dress by Christos was a perfect romantic and sophisticated gown that embodied her wedding style. Behind the Veil and Mimi Tran helped get this beautiful group wedding ready. 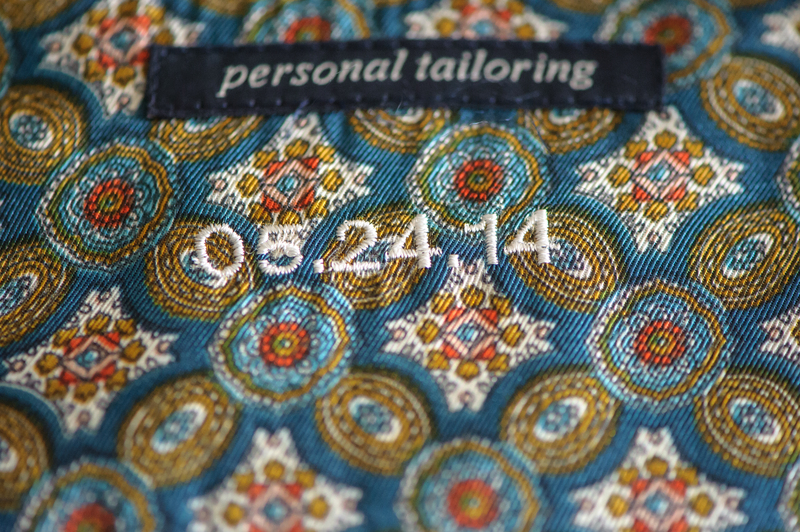 Justin wore a custom tuxedo from Suit Supply; love how the wedding date was embroidered in his collar. 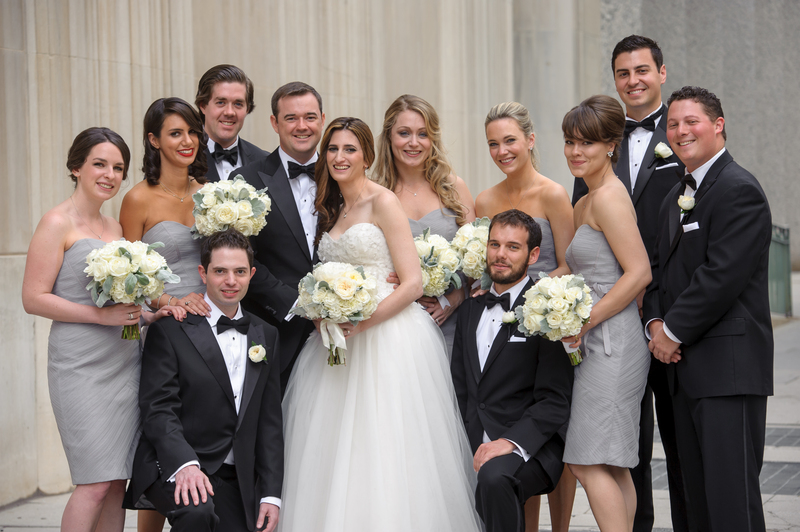 Before the ceremony, Jordan and Justin took photos downtown and at Lafayette Park with their Wedding Party. Jordan’s bridesmaids included longtime friends and her sister-in-law. 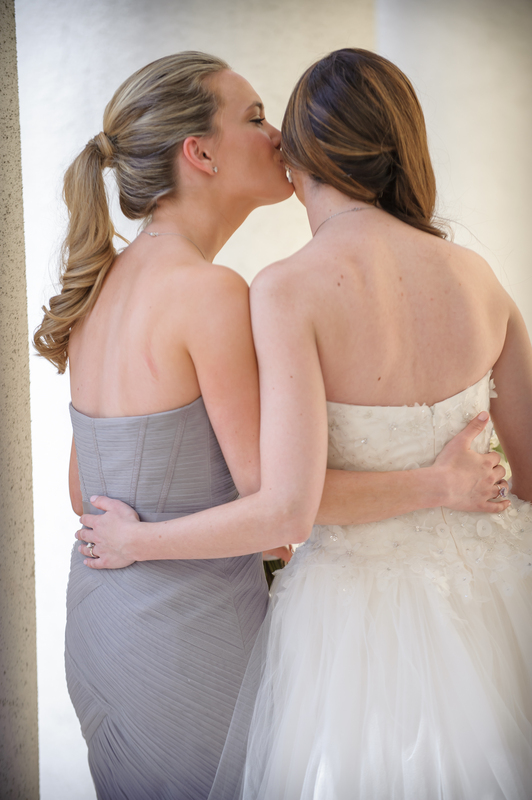 I loved their dove gray Monique Lhuillier bridesmaids dresses. 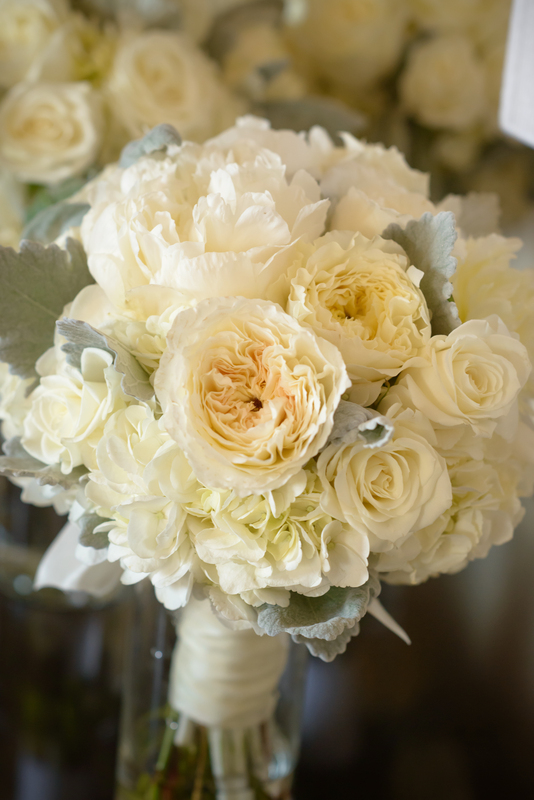 The white bouquets with touches of gray foliage from Edge Floral were a perfect accessory. Prior to the ceremony, Jordan and Justin took a moment to sign a Ketubah. 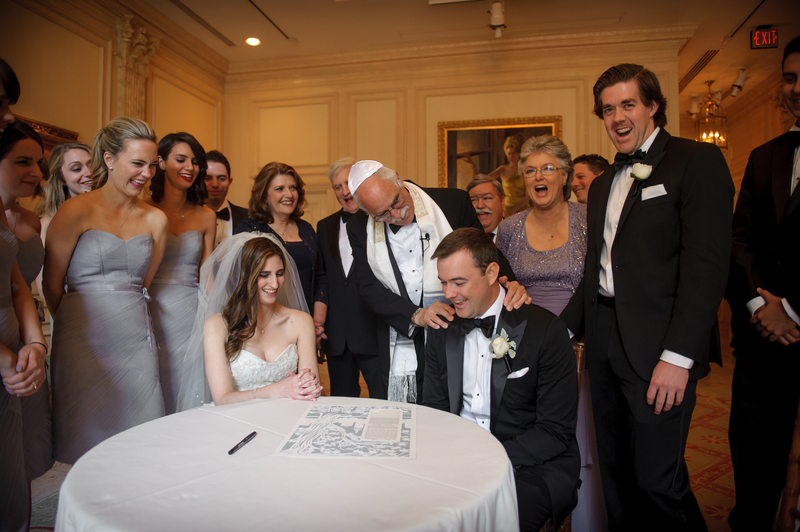 From Jordan: One of my favorite moments was the signing of the Ketubah. 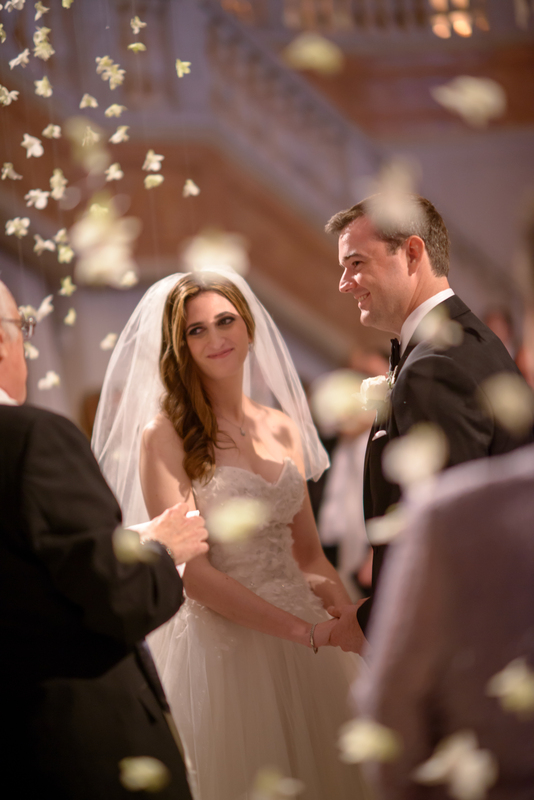 It was a very intimate moment during the wedding day with just immediate family and the bridal party witnessing us sign our commitment and love to one another. 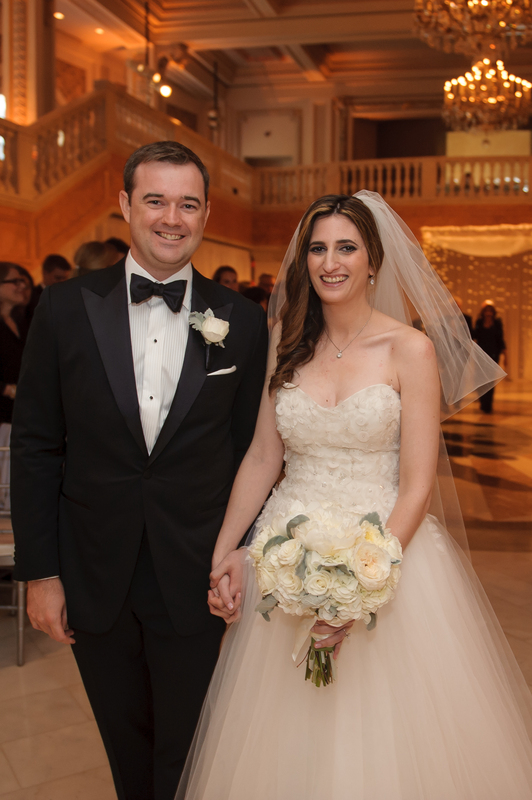 Jordan and Justin planned a Jewish wedding ceremony to honor Jordan’s background. 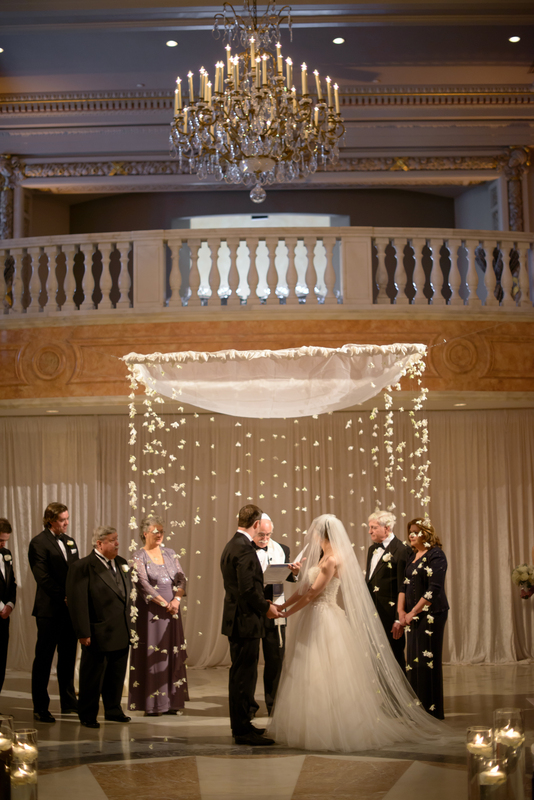 Their chuppah was even more breathtaking in person. 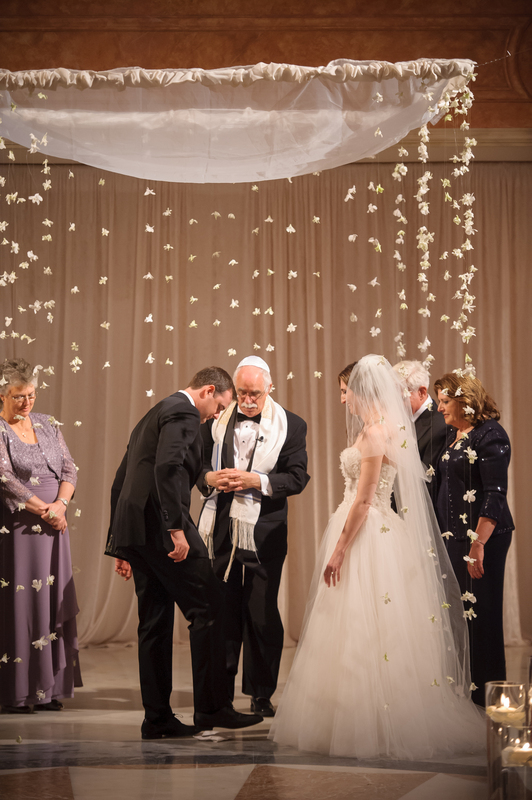 From Jordan: The chuppah had only white flowers, but they were hung so they looked like they were floating in the air. Rabbi Block worked with Jordan and Justin as their officiant. 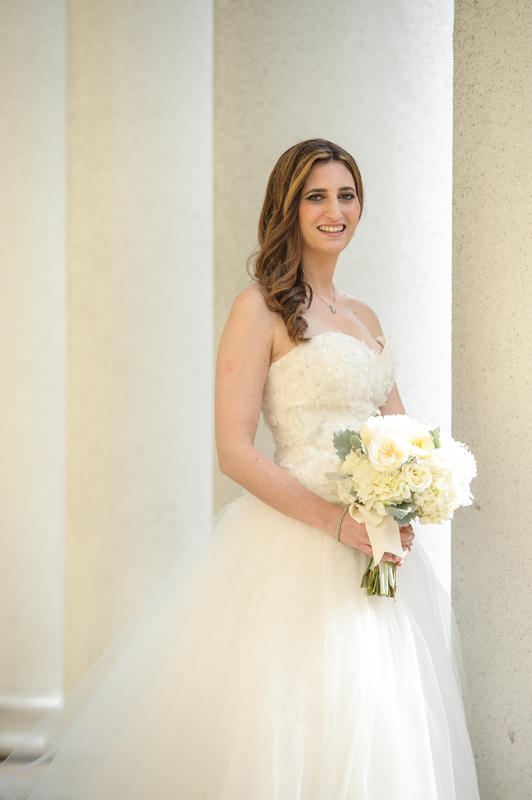 From Jordan: Although my husband is not Jewish, he was completely supportive of us having a Jewish wedding. 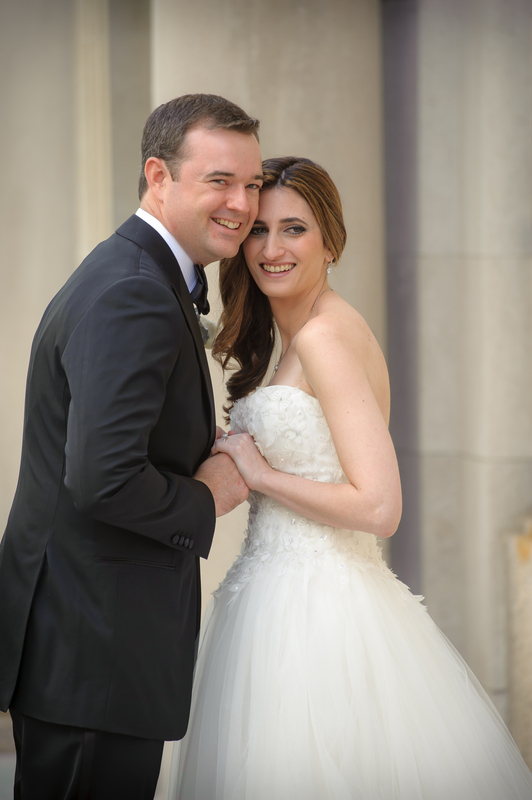 We spent a long time interviewing Rabbis to find someone who would marry us and celebrate our union in a way that made both of us comfortable. 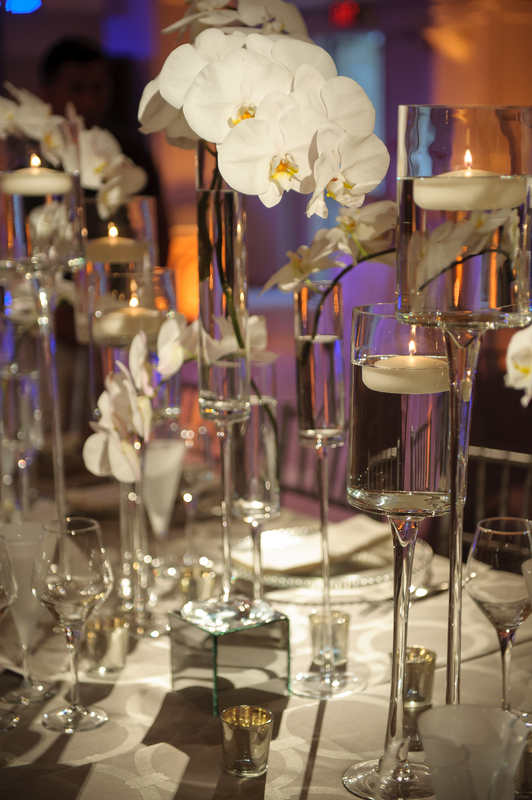 Rabbi Block did a great job making the wedding personal and keeping us happy and comfortable. During cocktail hour the space was transformed for dinner. 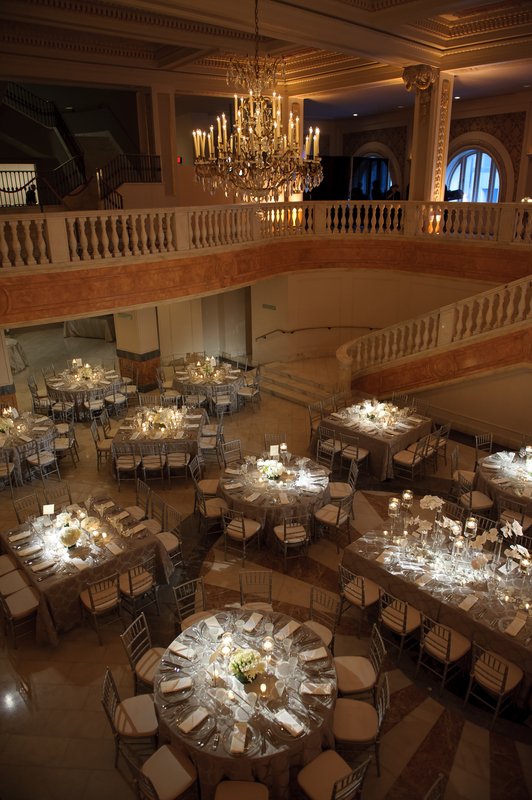 We incorporated a mix of round and square guest tables and a dramatic King’s table for the Wedding Party. 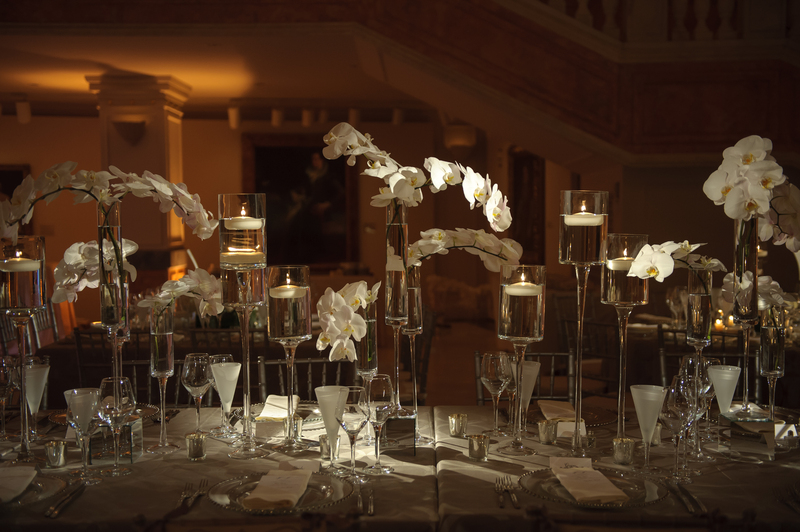 To keep things modern and sophisticated we used all white flowers. 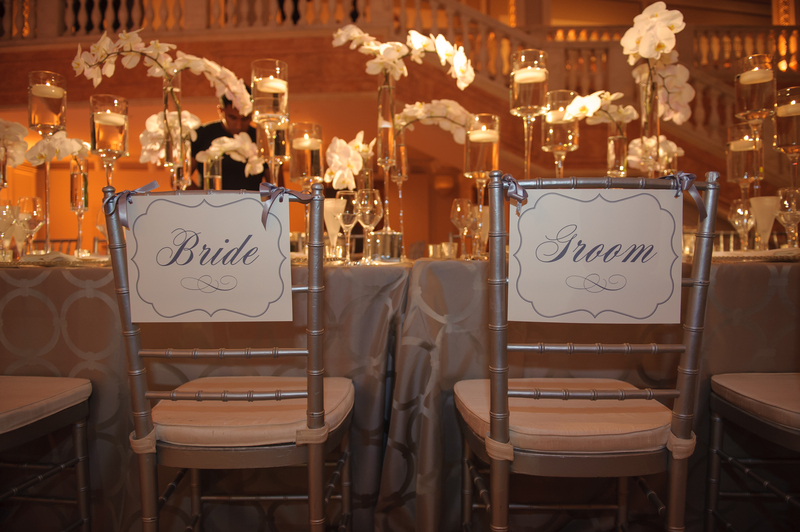 The gray patterned linens and ivory napkins made the white really pop. 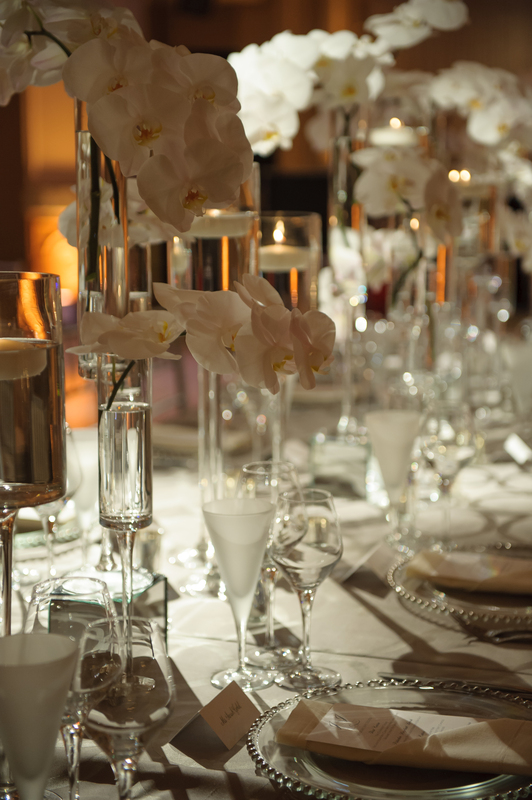 The mix of tall floating candles and gorgeous orchids on the head table created an elegant tablescape. 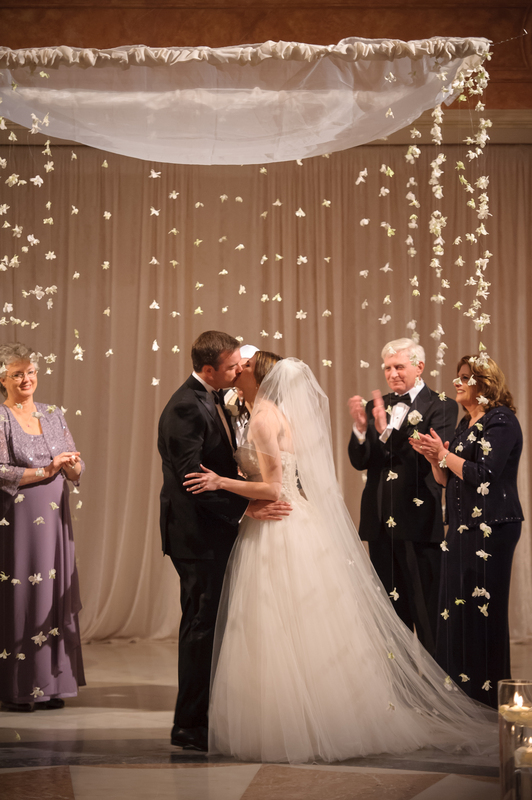 It was such a wonderful wedding for Jordan and Justin. It was sophisticated and romantic and also personal. 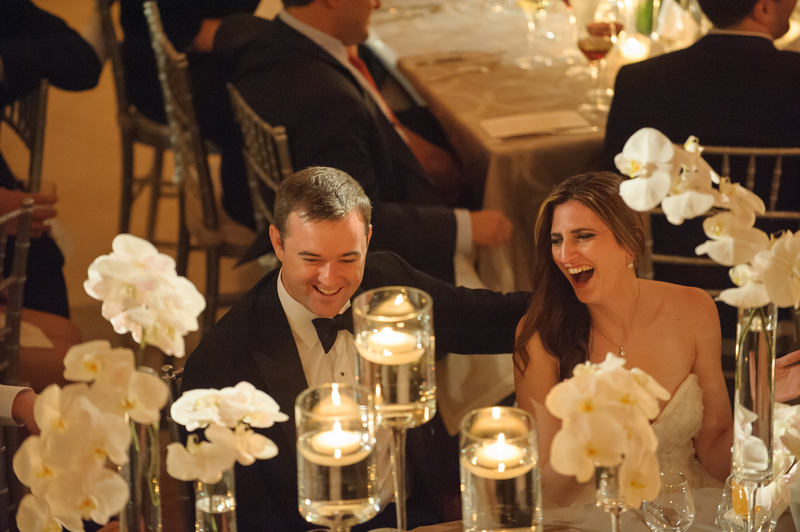 From Jordan: Justin and I found lots of ways to pull personal touches into the wedding. 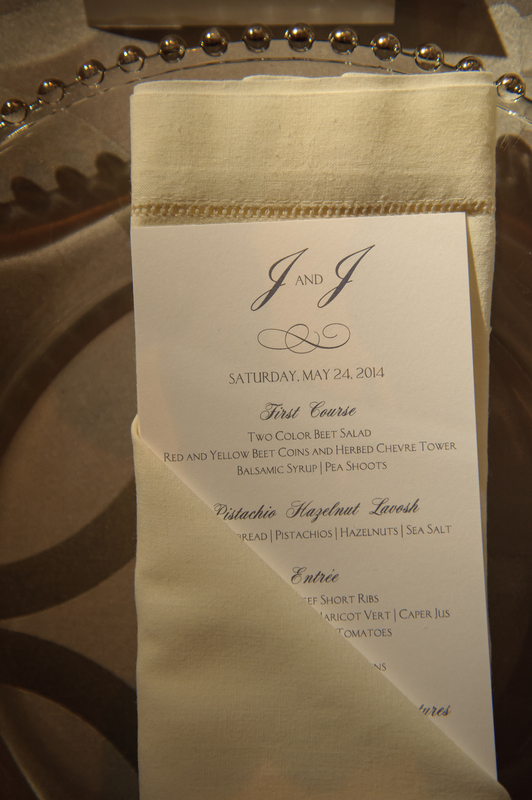 We had J and J printed on our hotel bags and had personalized J and J M&Ms, too. Justin is from Baton Rouge so we had mini shrimp and grits during cocktail hour and beignets for our late night snack (obviously in a J and J bag!). By our mini Jewish Deli we had signs posted that had “J and J Famous New York Deli Known as the Best Since 07.18.10″ which is the day we first met in New York. 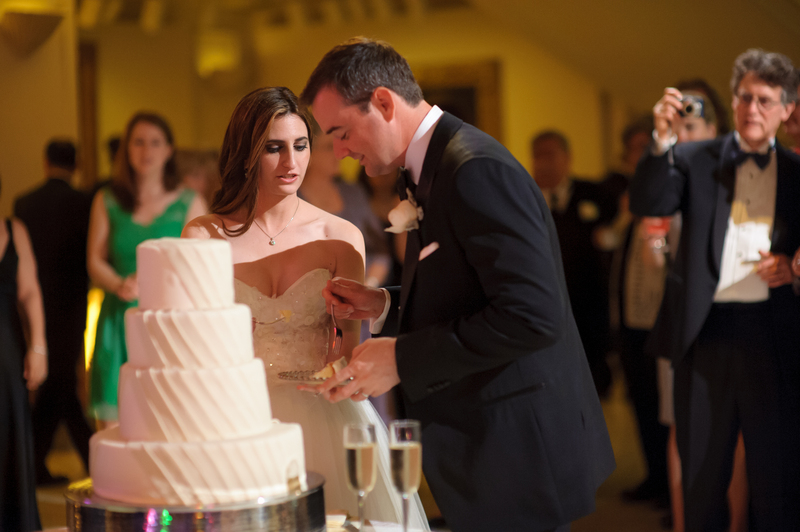 Congrats again to Jordan and Justin and thank you to Matt Mendelsohn, for capturing the day!